Forgive us if there’s a tone of pronouncement in our headline, but we’re pretty excited about what’s happened over the last month or so, and about what the coming months will bring. Meaford Haven’s Three-Seasons Retirement Community is moving rapidly closer to seeing the first spade in the ground, and realizing this unique retirement community vision. It’s been a painstaking process to take that vision from the initial idea to reality, and it has required a big investment of time, money and energy during the last two years. In order to have the property ready for a builder to actually begin work, we needed to clear three hurdles. We’ve now cleared two of them, and on Monday, we look forward to hearing good news from Meaford Council on the third and final step. First off, Meaford Haven needed to obtain an amendment to Meaford’s Official Plan to change the land-use designation on the property to accommodate the retirement community we envisioned, and to slightly reduce the size of the area designated for commercial use along the area fronting on Highway 26. The amendment was approved last fall. Next, Grey County needed to approve Meaford Haven’s Draft Plan of Subdivision, which creates the blocks and sets conditions for development. 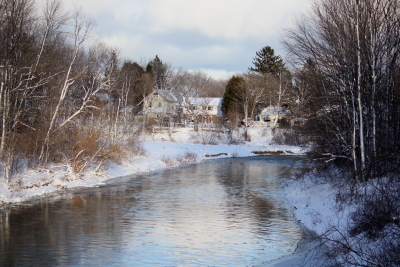 Last month, just before Christmas, the county recognized that Meaford Haven had addressed any concerns brought forward, and approved the Draft Plan of Subdivision. With the appeal period finished and no further action, this Plan is in full force. 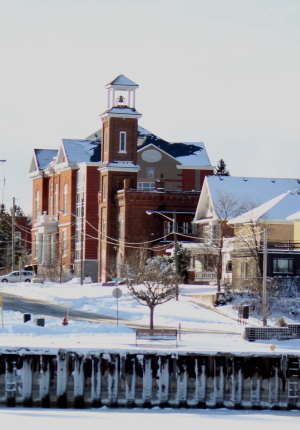 Finally, on Monday, Meaford Council will be presented with the zoning bylaw amendment, which defines more detailed conditions on the various blocks, and sets the stage for a builder to begin work on the Meaford Haven property. We look forward to celebrating completion of this third and final step, and we’ll share the news on this and upcoming developments with you here. 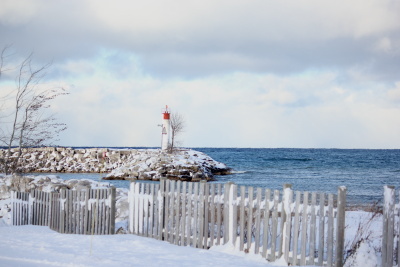 The snow has painted Meaford with a beautiful new palette. 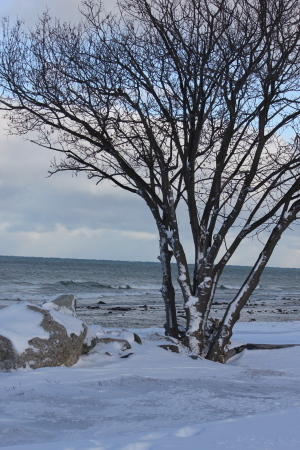 Had a chat with a friend the other day, and was surprised to learn she has just begun her “continuing class” (that is, the next level after beginner) of Taost Tai Chi, right here in Meaford. The two-hour sessions, which involve numerous excercises, just got more complicated and intense, she says. Based on the traditional schools of this internal Chinese martial art, Taoist Tai Chi is a set of gentle, slow moving exercises aimed at improving your health and fitness, no matter what your age. Classes continue pretty much weekly throughout the year. If you’re interested, now’s the time to check it out. On Monday, from 1 p.m. to 3 p.m., the group is holding an open house at Meaford Arena. Meet the instructor and learn more about this complex and rewarding practice. Visit the website. 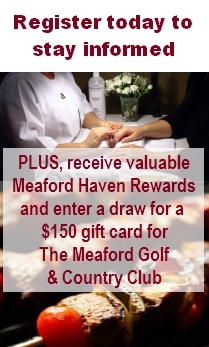 Or contact Judy Birch at 519-538-0288. If you’ve ever dreamed stepping in front of the footlights, or if you’re already a seasoned thespian, get down to the auditions for the lastest production of Meaford Community Theatre. “The Whole Town’s Talking”. The 1923 play by husband and wife team John Emerson and Anita Loos (Gentlemen Prefer Blondes) reveals the hilarious consequences when a man contrives a more interesting past to woo a girl. His invented history of an affair with a famous movie star does the trick – until the movie star (and her jealous boyfriend) come to town. Director Gordon Rowatt is looking for a cast of five males and seven females ranging in age from young adults to seniors, as well as bit-parts for several teenage girls. If you’re interested in taking to the stage at Meaford Hall for the production during the last week of April, head down to the auditions on on Saturday, January 12 from 3 – 5pm and Tuesday, January 15 from 7 – 9pm. Producer Greg Brown is also looking for other crew, including publicity, costumes, sets, prop and stage crew. Head to the auditions or Greg at 519-538-0517. 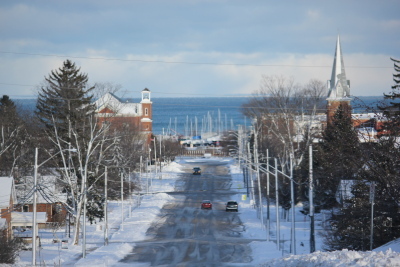 Meaford had a white Christmas, and as the year kicks off it’s time to break out the skis and/or snowshoes if you haven’t already. Here’s a quick rundown on a few of the local runs and trails and their current conditions. Twenty minutes down the road, Ontario’s largest ski resort is hopping with lots of snow from both Mother Nature and it’s state-of-the-art snowmaking system. With an average base of 55 cm. and groomed powder conditions, Blue has 12 of 15 lifts open and 30 of 36 runs open, as well as one terrain park. And the Village Mill Pond is open for skating. Head 20 minutes in the other direction, and you’ll find a groomed 10 km cross country trail system that gives you the feel of a backwoods ski. Though we’d enjoy some more snow (and the weather guys tell us it’s coming), the trails have been groomed and are in decent shape, with a few rocks still poking through. Yet another extensive cross-country trail system awaits you within a 20-minute drive. These wilderness trails are ungroomed (and it’s a good idea to carry a map, available from various nearby locations). Currently, the snow’s about 25 cm deep, and the trails are in decent shape overall; just keep an eye out for rocks. At the moment a small section of trails on the 60-km system are closed for logging. Within a half hour scenic drive, this attraction offers 27 kilometres of groomed beginner and intermediate forested trails with occasional spectacular views. As of today, they offer a base of 20 cm., with the entire system track-set. Skating, too. 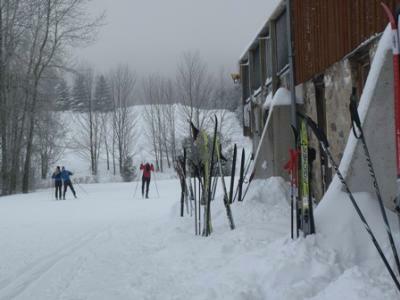 Not much further down the road, about 40 minutes from town, you’ll discover one of Ontario’s premiere cross country ski resorts. Nestled in the highlands, it seems to be in its own little snow belt within the snow belt. Twenty km of trails are currently open for classic and skate. 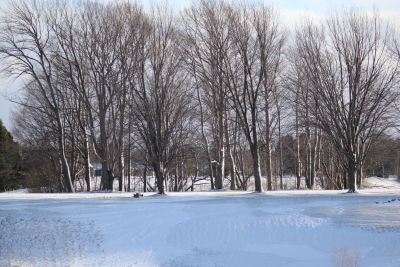 Take a 40 minute drive in the opposite direction, and head north of Owen Sound for 10 km of groomed classic and skate trails branching off from the cozy log clubhouse. While the trails are not yet track-set this year, skating’s good, and with snow in the forecast it won’t be long. Oh, and did we mention there’s more snow in the forecast?